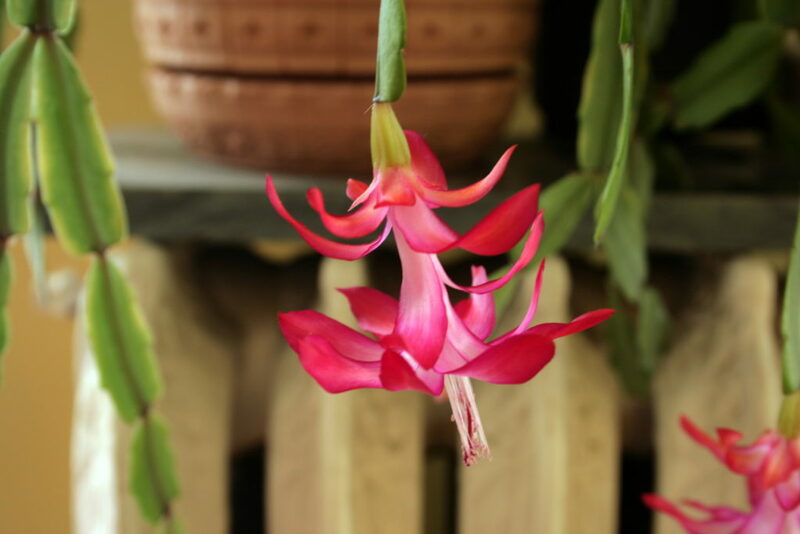 Like clockwork, the Christmas cactus is in full bloom as we head into its namesake holiday. Each year at this time, I go into hibernation mode from all things gardening, then these big house blooms catch me by surprise. They arrive with such a fantastical show as if to prove me wrong. They’re right. I am still growing something around here, and it really is a pretty little something. Truth be told, I don’t put the time into these house plants that one might choose to. Fertilizer, meh. Watering, inconsistent at best. These plants get good and wilty before I’m reminded to give them a drink (as evidenced by the brown leaves on the Peace Lily). That might be why I failed miserably in my attempt to grow a Black Spanish fig in an indoor pot. My saving grace really is the big south-facing windows in this old house. They let in all the light, and the plants are happy for it. I really am, too. Keeping house plants makes me ridiculously happy, actually. I tuck a few in every room for the eye and for the air. I really can’t have too many. 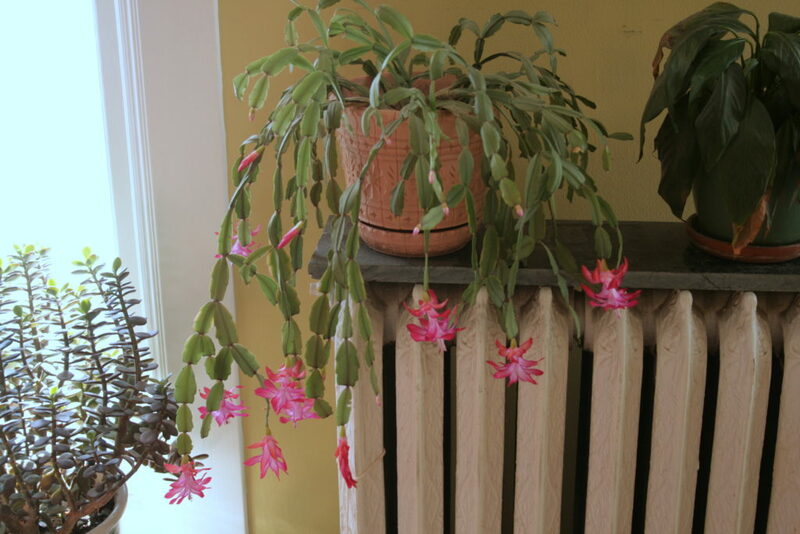 The Christmas cactus is an easy one to keep, once you learn the hard way that they do not like to be in the direct light of your window. They apparently hail from Brazil and like it humid, though our house certainly is not. I read somewhere that they will not bloom until the nights are below 68 degrees. This, our house certainly is. 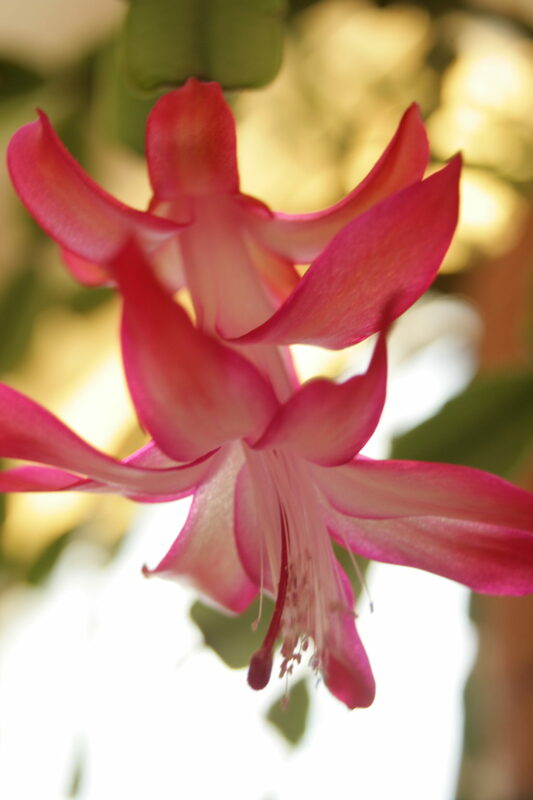 The cooler nights, and the shorter daylight triggers the blooms, just in time for Christmas decoration! Do share some of your favorite house plants in the comments! I’m always interested in new ones.